I have struggled with my skin for the past 15 years. Sad but true. When I was younger, I was plagued by cystic acne and being a teenager, I just LOVED to pick at my face. This of course resulted in tons of scarring which then led to tons of treatments to help get rid of the scars. Fast forward to the past few years, my acne came back with a vengance. I was CONSTANTLY broken out and even though I wasn’t picking, I was still left with tons of discoloration and scarring. I finally decided to start seeing Kat at Derma Beauty Aesthetics back in October. It was by far the best decision I have ever made. Not only is Kat such a doll, but she is an expert in all things skin. She really took the time to analyze and learn my skin and came up with a plan of action. 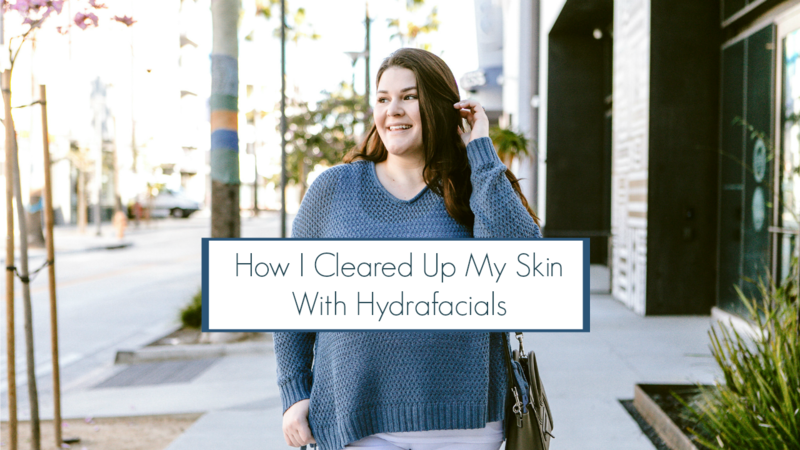 After my first hydrafacial with Kat, I could immediately tell a difference in my skin. It was way less congested, my pores appeared smaller and my skin felt so much softer and more supple. Going into my 4th hydrafacial – I usually go about once every 4-6 weeks – I decided I need to steup up my game and try the SkinBetter line that Kat recommended. It’s a medical grade skincare line that can only be purchased through a licensed professional. And although it comes with a bit of a price tag, the bottles have lasted quite some time and the results are absolutely undeniable. Between the hydrafacials and the SkinBetter line, my skin looks the best it has EVER looked. And although I will occasionally get a pimple, they are far and few between and NO MORE BREAKOUTS! Kat and I thought it would be fun to document the hydrafacial experience so I put together a little video that shows the process from start to finish as well as the not so pretty resulting “gunk jar” at the end. I seriously couldn’t believe what came out of my skin!